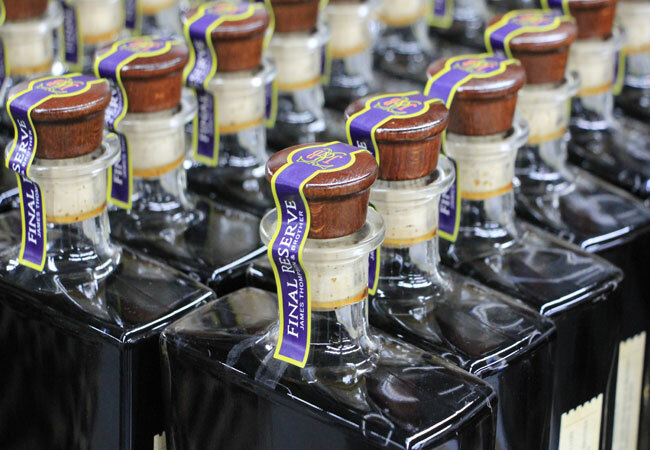 Final Reserve is 45 years in the barrel and there are only 250 bottles in existence. They go on sale at the Frazier History Museum on March 1. Let the games begin. your wallet and a sleeping bag, then stake out your spot on the sidewalk. Embracing its status as soon-to-be starting point of the Kentucky Bourbon Trail, the Frazier History Museum is getting into the bourbon business with Final Reserve, James Thompson & Brother Kentucky Straight Bourbon Whiskey, a spirit that’s 45 years in the barrel and for sale for one day only. The frenzy is being fueled through a discreet on-line campaign in which the Frazier reached out to potential purchasers – many of whom immediately and enthusiastically responded. But they must show up to buy a 750-milliliter bottle, which comes in a display case with a tasting bottle, a crystal tasting glass and a piece of the barrel stave... all for the low, low price of $1800— every penny of which will go to charity. If you can’t get your hands on a bottle, you can still share in the excitement of a cocktail and rare bourbon tasting that evening with Glenmore Distillery and the Bourbon Classic Review. It’s the type of enticing, engaging event we expect from the museum that will be enthusiastically greeting the intrepid adventurers on the Bourbon Trail. Tickets for the Taste History event will be available at fraziermuseum.org.